If you want to feel peace in your life, recognize the Source of all your blessings. By yourself, in peaceful surroundings, say it out loud so you can hear what you are thankful for. 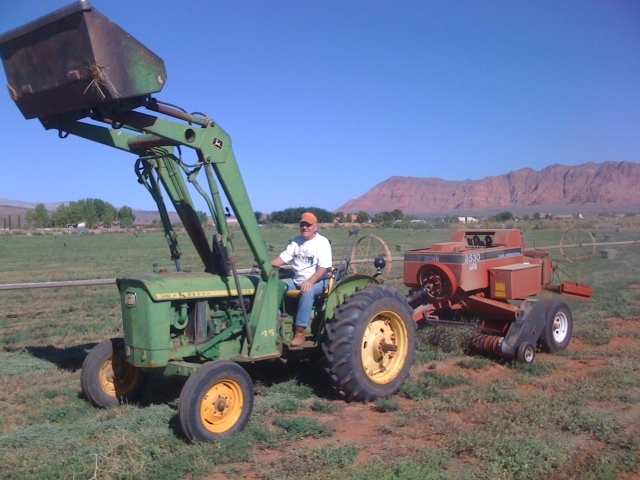 I have many favorite places to thank my Heavenly Father, but one of my favorite is driving my tractor working on my farm. I’m going to just focus on one area, our wonderful world to be grateful for in this example. We live in a most beautiful world that our Father in Heaven has created for us. I look at the beautiful world that I live in. I am grateful to Heavenly Father for the majestic Red Mountain to the North of my fields that watches over our valley. I am grateful to Heavenly Father for the rugged blue Pine Valley Mountain standing guard at over 10,000 feet elevation in the background that provides the snow pack that feeds the Santa Clara Creek that provides the water for my fields to water my alfalfa to feed my cattle and horses. I am grateful to Heavenly Father for the majestic white clouds that bring the rains and for the clear blue sky overhead and the wonderful sunshine that is so important for our existence. How blessed my family is to have the stewardship of the fields and property we have been blessed to have. May I suggest you say, “I’m grateful to Heavenly Father for … “ and say in detail what you’re feeling gratitude for. You will be amazed at the feeling of peace and sincere appreciation that will fill your heart. We are so blessed! Gretchen and I have had a busy week with the opportunity to help people in southern California find out what the stress is in their lives and how to deal with it by using the principle of forgiveness. The Olson’s were so gracious and hospitable to us and appreciative of what we were able to do for their family and friends. We loved every minute of the week. The weekend was spent in northern Utah with family and friends. We were excited to meet our 25th grand child, Fisher Tyler Graf and stay with our 24th grand child Gwen, her Mom and Dad and her two brothers and two sisters. We enjoyed our daughter Megan’s three youngest children going with us to be with cousins. Buck and Julie are great hosts. We loved the opportunity to share Graf Stress Management with a group of very appreciative folks at Kathy’s home in Centerville on Saturday. What Love we felt from everyone there! At church on Sunday with our family in Alpine, we were approached by a lady who had been to see me over 20 years ago, to let us know that her visit to us had changed her life and had been such a blessing in her marriage as well. Yes, it is great to be appreciated and I appreciate them for all they have done for me. This is one of my favorite poems regarding forgiveness. This is an English translation of a Scottish Poet Robert Burns. It actually reads better in the English version. I hope you like it and put it into practice. I try to forgive and allow people the free agency to be less than perfect and let the Lord be the judge. Are not all of us sinners? Therefore look gently on men, And even more gently on women. Although they may go a little wrong, Do not condemn them. Above all consider not merely what they have done, But why. To judge actions and motives and regrets. Only God has the authority to judge. I grew up with typewriters, erasers, and white out, or just start over, so anything with a keyboard is very intimidating to me. Here it goes, whatever. It has been suggested that because of Graf Stress Management and the importance of it in helping people deal with the trials in life, it is time for me to come into the information age and begin to share this knowledge with the world. I am not sure exactly where to begin but if no one else ever reads a word, I am writing this for my posterity.